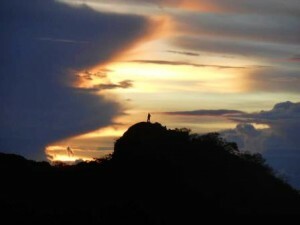 Gunung Ciremai (3,078 m) is the highest mountain in West Java, near the border of Central Java and south of Cirebon. 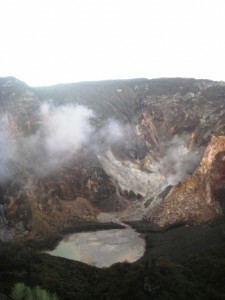 It has a distinct volcanic cone with a deep crater that is occasionally active. 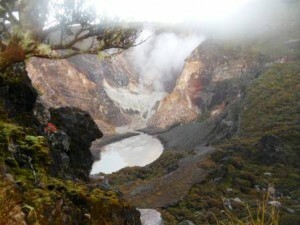 The crater is not particularly interestingly but does have some active fumaroles and a small, milky lake below. 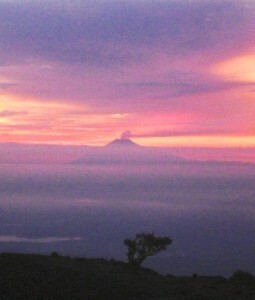 Spectacular sunsets/sunrises and views of the north coast of Java, Slamet to the east, and mountains to the south-west can be seen. The crater rim can be circuited in about two hours and provides vantage points for even more spectacular views. There are three routes up the mountain. 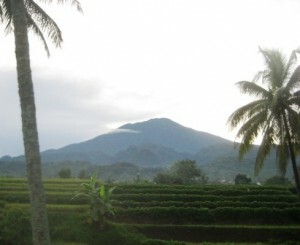 Java Lava normally climbs via the Apuy route, from the west on the Majalengkar side being the route closest to Jakarta and also the shortest. The trail is more or less straight up the mountain and therefore steep. The trail head at Desa Apuy is at 1,220 m making for a vertical climb of about 1,850 m or 5-7 hours. 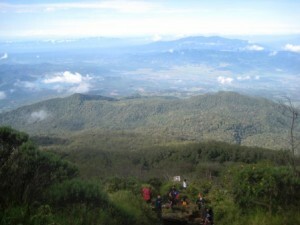 The climb is pleasant through typical Javanese forest that undergoes the usual transition from leafy evergreens in lower montane forest to dwarf shrubs and mosses on the upper slopes. 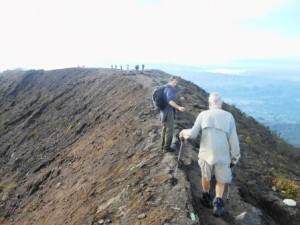 The final ascent to the crater rim is very steep but on rock, unlike the volcanic scree that makes the summit climbs of mountains like Slamet and Rinjani such a challenge. Camp Sites: Pos VI (2,948 m) is a good camp site at a small extinct side-crater, Goa Walet (Swallow Cave), about 20 minutes below the crater rim. There may be some water in the cave – but don’t rely on it! Porters usually camp here so it will be noisy throughout the night (ear plugs!). Other camp sites are just below or on the exposed rim itself. Water and Porter Packs: All water (min. six liters) must be carried. You must be fully equipped and provisioned for a cold and, possibly, wet and windy night at 3,000 m. Even in the dry season, you must be properly prepared for rain. All of your gear must fit into your porter pack (not to exceed 18 kg including water) and your day pack. The Crater Rim Circuit: This is well worth doing – better in an anti-clockwise direction. The true summit of Ciremai is on the northern side of the crater. The trail is along the rocky crater edge sometimes dipping down into bushy vegetation to avoid dangerous knife-edge sections. Several vantage points provide excellent views into the crater and of mountains to the east and south-west. 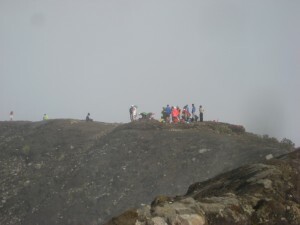 Everyone goes to the crater rim but very few do the circuit and reach the true summit. Suitability: This trip is for experienced, reasonably fit climbers and older children only. The descent is tough on knees and thighs. 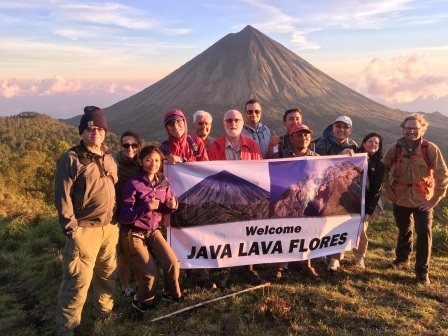 Indicative Program; Java Lava will provide those who express interest in joining this trip, when announced, with further details. Friday: Bus from Jakarta to Majalengkar (about 5 – 6 hours); overnight in a hotel at Majalengkar. Leave travel clothes at hotel for mandi before returning by bus to Jakarta. Saturday: Early start; local transport to the Apuy trail head; sort porters and porter packs. Sunday: Very early start if you wish to circuit the crater rim. Begin descent in good time for mandi at the hotel before busing back to Jakarta; late lunch en route. Acknowledgements: Dan Quinn, John Hargreaves, David Donaldson and Nick Hughes for material used in compiling this page.